What crazy thing can you do in a minute or less? Minute to Win It style games are fast-paced, fun competitions that look deceptively easy, but frequently prove to be challenging. 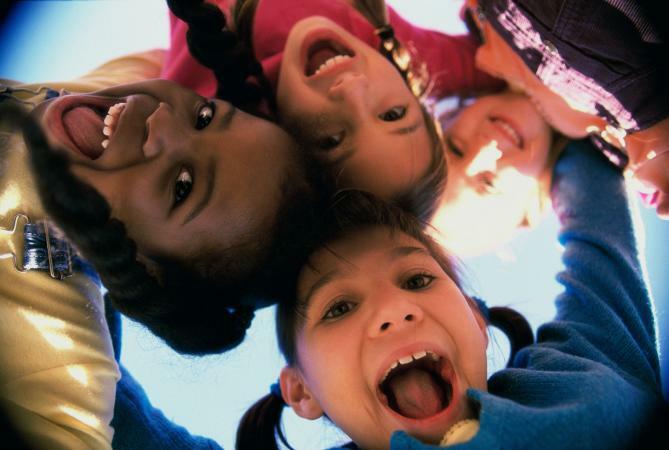 Whether at a party, a family game night or even in a classroom, try these games for a fast-paced battle of wits and skill. The general idea is that each game should take only 60 seconds. If you stick true to the game show, you are eliminated once you're unable to complete a challenge. However, a party where people can't play all the games is hardly fun, and children will love that they get to compete each time. As an alternative, set up a scoreboard and award points based on how successful each team was at completing a task in under a minute. For every game, you will need a 60-second timer. 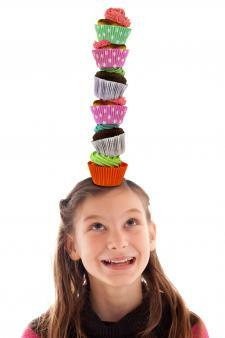 The goal here is to stack six cupcakes on your head and hold them there for 10 seconds without dropping any. Stop watch (in addition to the timer) so that you can time how long cupcakes stay in place. Participants may use their hands to stack, but the 10 seconds doesn't start until their hands are fully at their sides. A participant may move his body to help balance the cupcakes, but not his arms or feet. 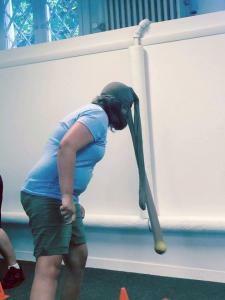 Using a pair of pantyhose on your head like a swinging trunk, can you move a football around a set of cones? Put a tennis ball in a pair of pantyhose and move it down to the toes. Make a start line by taping masking tape on the floor. Have each participant put a pair of pantyhose over her head. Set up a line of cones with enough space between each one to move the football through. Place the football at the start of the line of cones. Each person must use the tennis ball at the end of the pantyhose like a swinging trunk to move the football around the cones. The football can touch the cones, but cannot knock one over or the participant has to start over again. If the participant swings and knocks a cone over, she must reset the cone and start over again. The participant must keep her hands behind her back. Building s'mores is easy, right? Perhaps, but it might be more difficult than you think if you can only use one hand and a set of chopsticks. The goal of this game is to build a s'more, complete with graham cracker, chocolate, and marshmallows, in less than 60 seconds. Ideally, each participant should have her own table so that no one who bumps the table inadvertantly undoes the other team's work. Set two halves of a graham cracker, the half of chocolate bar, and one marshmallow on a plate. 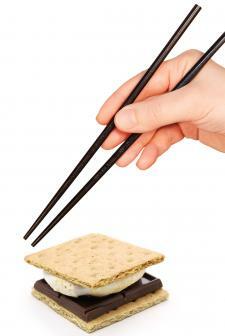 When you say go, each person must use the chopsticks to build a s'more on the empty plate. The participants can only use chopsticks and one hand to move the food. The participant's other hand must be at her side. If something falls on the floor, the team member may use her hands to pick it up and put it back on the first plate. The s'mores must be in order with one piece of graham cracker at the bottom, then the chocolate, then the marshmallow, then a final graham cracker half. How many stickers can you pick up in 60 seconds? It's much harder than it looks! Place the stickers, sticky-side-up, on the tray. 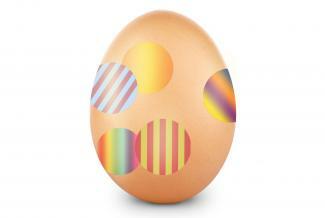 If the egg drops, the participant must start over again. Can you get tic-tac-toe in less than a minute? It will take excellent aim and a lot of luck. 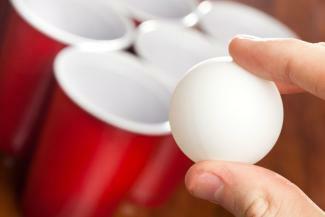 Set up a table with a three-by-three array of cups, set right side up. Set up a starting line with masking tape about three feet away from the table with the cups. Players will compete one-on-one, so create pairs to compete against each other or divide your group into teams. Players cannot step past the start line. Each of the two players is assigned a color of balls. Players then take turns tossing them. Players must toss their colored ping pong balls to land in a tic-tac-toe formation. What do you get when you combine cotton balls with a plate covered in syrup? More than likely, you'll have a giant sticky mess, but a lot of fun as well! 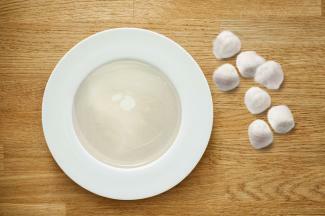 For each team, smear a paper plate with your sticky substance of choice. The plate should have enough on it that cotton will stick, but not so much that syrup is dripping off all over the place. Set players about three feet apart, facing each other. One will hold the plate and the other holds the cotton balls. When you say go, one player tries to toss cotton balls, while the other player with the sticky plate catches them. Catch as many as you can in a minute. Can you use a party blowout to knock stuff over? This activity is strangely addictive. On a table, set up the toy soldiers about an inch apart. Participants have to knock over each soldier using only the party blowout. Participants can use their hands to hold the blowout, but they cannot use their hands to help knock anything over. If a participant knocks two over at a time, he must set them both back up and try again until he only knocks one over. How good is your aim? Find out in this game of speed and precision. Set up paper cups in a line. Give each team one plastic spoon and a package of candy. Have players stand a few feet away from the cups. 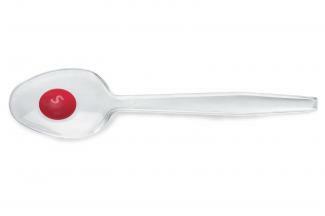 Instruct players to put a candy on the spoon, bend it back and 'shoot' the candy towards the cups. The goal is to get the candy into the farthest cup, which will earn the most points. However, getting candy into any of the closer cups will also earn points. Although Minute to Win It style games require a lot of materials, they are also a lot of fun. Challenge your friends, your family or even your youth group for an unforgettable evening of fun.